Personally, I have mixed feelings about this email. Okay, mixed feelings for about two seconds and then excitement sets in. I’ve said it before, and I’ll say it again: I love August and back to school time. Maybe it’s because I was a teacher before having children. Or, and probably much more likely to be the case, I personally thrive on consistency and routine and find my children are the same way. Summer is a time when both those words have absolutely no meaning. It’s been a fun summer. We’ve gone to the movies on a random Tuesday night, without caring about bedtimes. (PS: Incredibles 2 is a fantastic movie–even better than the first one.) We traveled to Iceland with the kids. We’ve had fun in the kitchen, enjoyed picnic dinners at the beach, and watched way too much Netflix. <–We’re just catching up on the last nine months of new content. It’s been a good summer. And now it’s time to enjoy the last few weeks, all while preparing for a new school year. We talk a lot about food prep here on the blog and over on Instagram. I’ve personally seen the benefits of meal prep (even if this means preparing just one breakfast item) in my own life. Meal prep has helped us simplify our full weeks, allowing us to spend less time in the kitchen during the week. I encourage you to give meal prep a try. Start small, with just one thing. This one thing may look like preparing one breakfast item, or chopping a few veggies for snacks and lunches. By starting now, you’ll get into a routine with meal prep and build some meal prep muscles. I think you’ll be amazed at how much of an impact preparing just one thing can have on your week. They’re easy to make. About 15-20 minutes is all you’ll need to prep muffins. They don’t require any special reheating. I keep muffins in the fridge and take out as many as needed when I wake up in the morning. By breakfast time, the muffins are usually around room temperature. 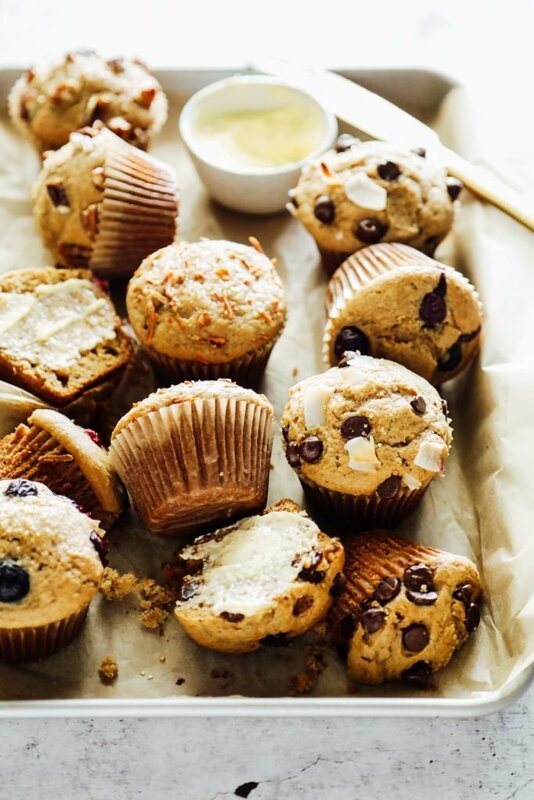 Muffins may be reheated in a microwave, too. They will feed a family for multiple days, especially if paired with eggs, yogurt and fruit, or smoothies. <–This keeps the muffins from getting boring morning after morning. 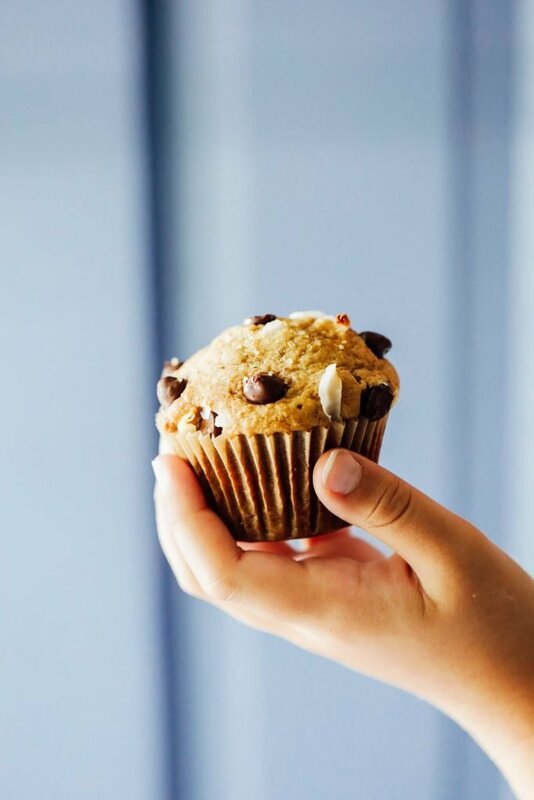 It’s easy to cook once, eat twice with muffins. Make a double batch so you can save some in the freezer for another week (or even later that week). For most flour-based recipes, I don’t recommend doubling recipes in the same bowl since the results aren’t always favorable. 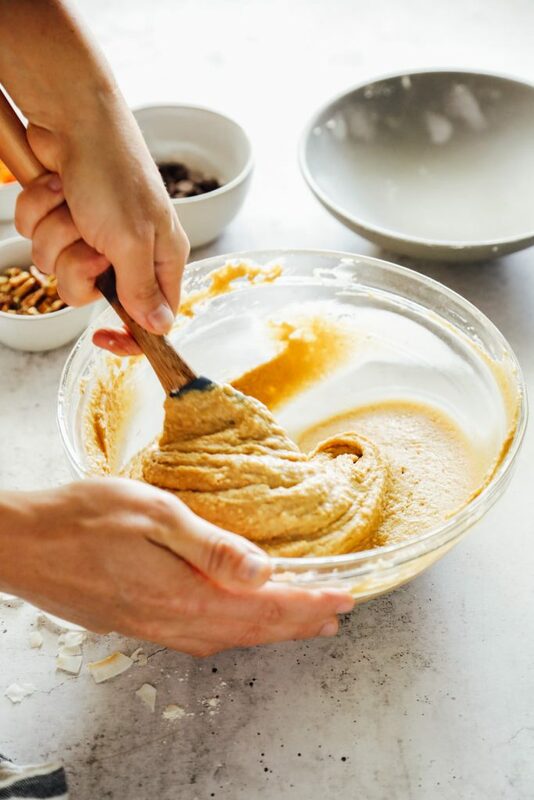 Use two bowls, and whisk together each batch in their own separate bowl. Sure, this means cleaning up an extra bowl, but think about the time savings in the future. Muffins aren’t just for breakfast. They also make a great lunchbox addition and snack. Later this week we’re going to make a flourless, blender muffin recipe. 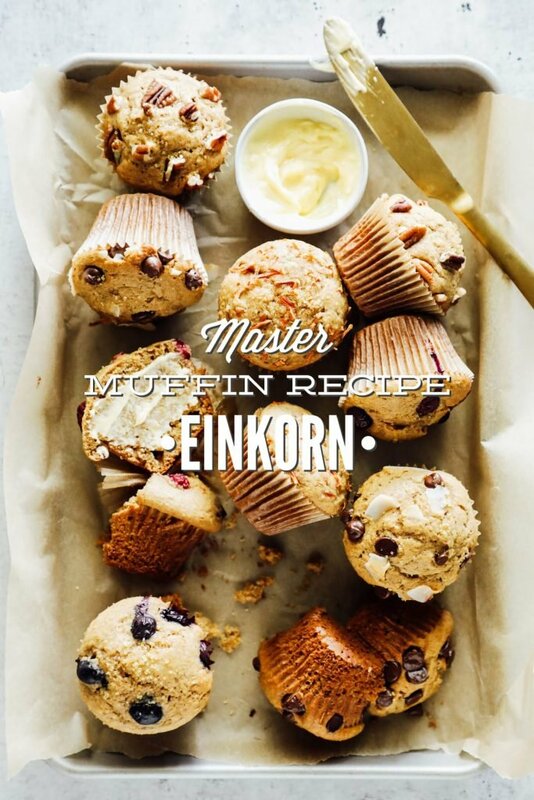 Today we’re going to make muffins using einkorn flour. I’ve received a number of requests for particular baked good recipes made with einkorn flour. One of the requests that stood out was for a master muffin recipe. The suggestion was to create one master muffin recipe with multiple possibilities. What a great idea! Talk about simplicity. Over the past couple of months, I’ve been tweaking this master recipe to make it just sweet enough, just moist enough, just flavorful enough to be able to work with multiple mix-in options. Today’s recipe is just that–a incredibly versatile muffin recipe that can easily be customized to your liking. Feeling like a blueberry muffin this week? No problem! Use this recipe as your base. How about chocolate chip and coconut muffins? Awesome! Do it! Start with the base recipe and add in your chocolate and coconut. What about veggie-filled muffins? Yep, add those veggies. This recipe is perfection, in my opinion. Simple, basic perfection with so many possibilities. 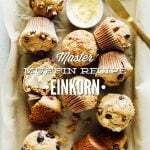 A master einkorn muffin recipe with multiple mix-in possibilities. 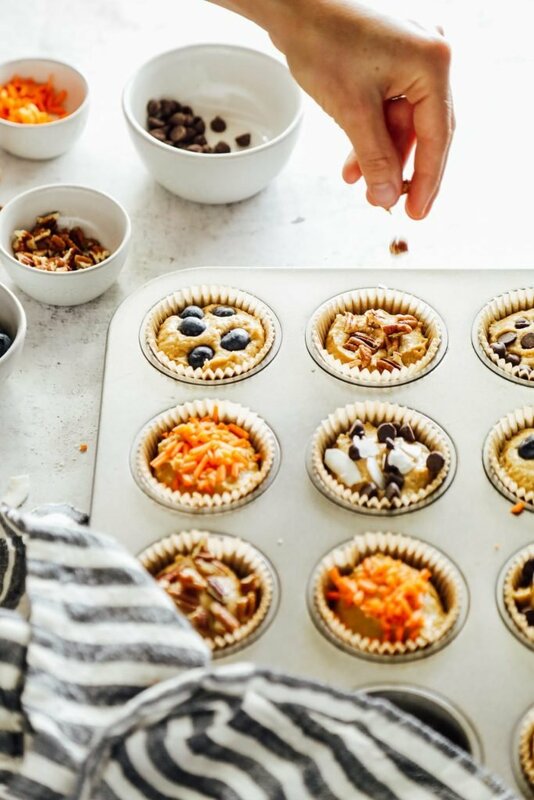 Make these muffins your own by adding your favorite mix-ins, like: chocolate chips, fruit, nuts, or shredded coconut. Preheat the oven to 350F. Grease or line a muffin pan. 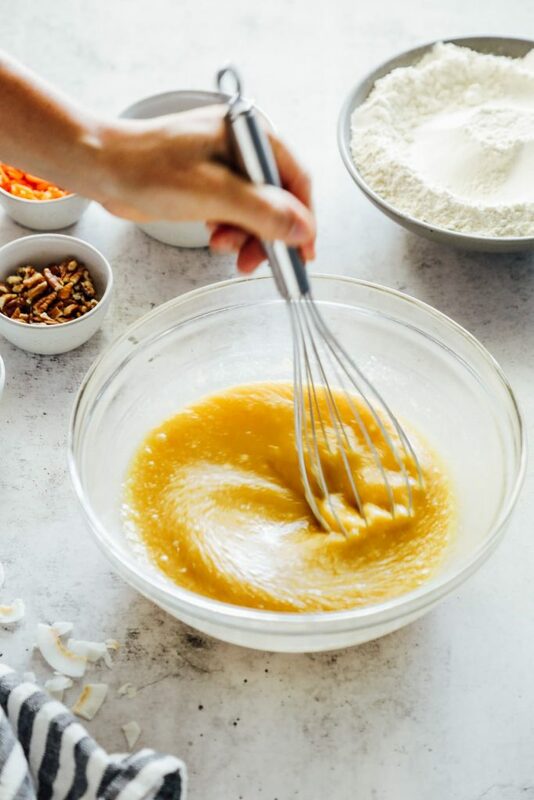 In a large bowl, whisk the wet ingredients together: melted butter, maple syrup, applesauce, eggs, and vanilla extract. Add the dry ingredients to the wet ingredients: sifted einkorn flour, baking powder, baking soda, cinnamon, and salt. Stir to combine. Add any customizations desired (see notes, below). Stir to incorporate the customizations into the batter. Scoop the batter into the muffin pan (it will be thick). I use an ice cream scooper. Bake the muffins for 18-20 minutes, until firm on top. My muffins are usually done at 18 minutes, but this may vary with each oven. 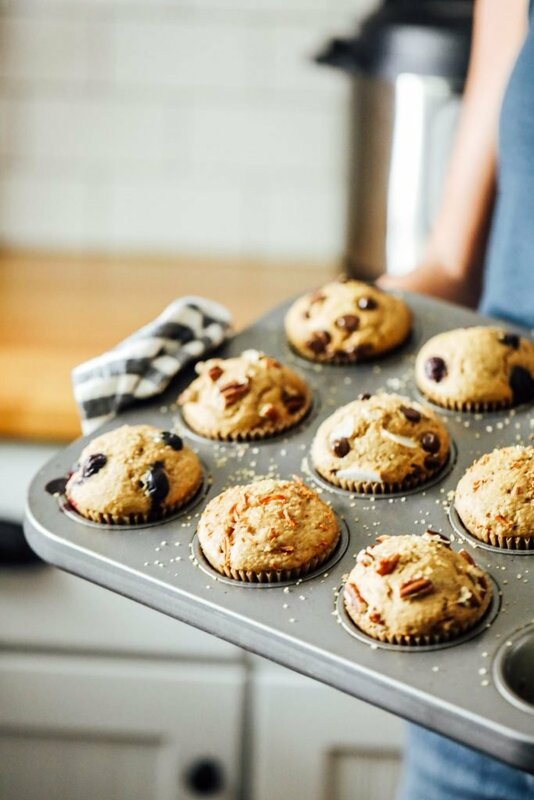 Allow the muffins to cool for a few minutes before enjoying. For storage, I keep the muffins in an air-tight container in the fridge for up to a week. They also freeze well. *If you'd like to use whole wheat einkorn, decrease the amount by 1/4 cup. This is a master base recipe that’s meant to be customized. Here are a few mix-in ideas to customize this recipe. 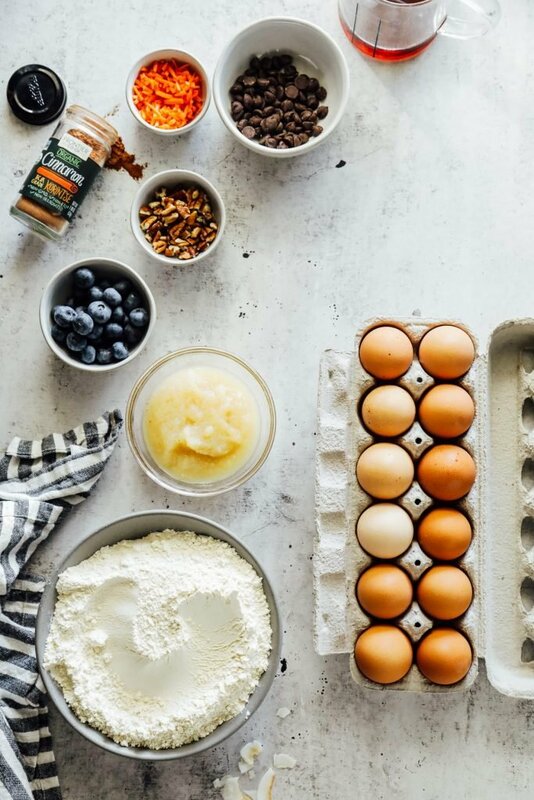 Choose one option each time you make these muffins, or stick with your favorite from the list below. 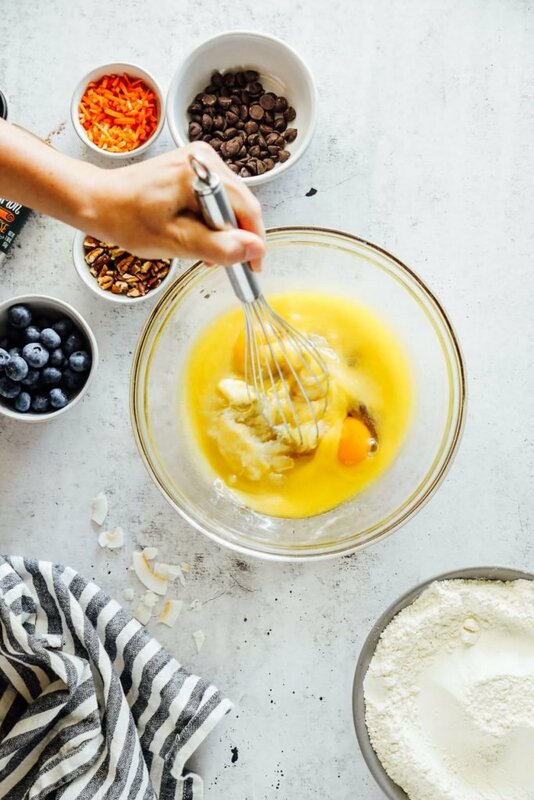 For dairy-free muffins, use melted coconut oil in place of the melted butter. Is there a way you can make theae into banana or pumpkin muffins? Hey Maggie, You could try replacing the applesauce with mashed banana or pumpkin puree. Oh yeah…I didn’t think of that…is the flour easy to find?and what is a good in season produce I could use right now? Many health food stores now sell einkorn. Whole Foods doesn’t sell it yet. My favorite brand (and the easiest to find it Jovial). Blueberries would be good right now. You could even try some chopped cherries, even add some chocolate chips–cherries and chocolate chips are a delicious combo. Someone told me they were going to try chopped peaches. This is perfect! I’ve been looking for a good einkorn muffin recipe and these are delicious. I made a batch this morning with shredded carrots and they are like happy little carrot cakes. My kids (and me) put such a dent in the batch that we quickly made another with blueberries this afternoon. I keep chasing everyone out of the kitchen while they cool so we have some to freeze. Thank you for sharing, this one is a big winner!!! Yay, Katie! I’m so happy to hear that. I tested this recipe soooooo many times and loved the final outcome. Thanks for the recipe. This is the first time I’ve tried einkorn flour and I’m looking forward to trying more recipes with it. Have you ever used it to bake a cake? By the way I’m just over the bay in Tampa do you ever do cooking classes of any kind? Hey Julie, I have a cupcake recipe: https://livesimply.me/2017/06/21/homemade-vanilla-einkorn-cupcakes-buttercream-frosting/ And I’m working on a chocolate sheet cake at the moment. I don’t offer cooking classes at the moment, but possibly again in the future. This was my first time baking at elevation, since I moved to Colorado, but the muffins came out perfect. Flatter than yours, but so delicious! I love that you have so many great Einkorn recipes. Love your site. Yay, Keke! I’m so glad you enjoyed the muffins, and they even worked at a high elevation. Thanks for the recipe. You recommended here einkorn flour for making this recipe. If I use almond flour for making this can I make this? or I need to use einkorn flour to make this? Thanks in advance for giving me the clarification. Hey Regina, Almond flour will not produce the same results. For this recipe, you’ll need einkorn. I made these muffins for the first time yesterday, and we loved them! My add in was 3/4 cup peeled, chopped Gala apple, with 1/4 cup chopped dried cranberries & walnuts (I also added the extra 1/2 tsp. of cinnamon & the 1/4 tsp. nutmeg as you suggested). These were delicious! We can’t wait to try them with some of the other add in suggestions. Thanks for another great recipe! Hey Diana, I’m so glad you’re enjoying the muffins. Love your additions! Yay, Ashley! U’m so glad you’re loving them! I’m making some vegan muffins for my daughter’s school and am wondering your thoughts on using coconut oil instead of butter and applesauce + lemon instead of eggs. I’ve never tried it with Einkorn, have been successful with other flours. TIA! Hey Tamara, I’m not sure how they’ll come out with all the changes. Coconut oil will work as a sub, but the applesauce and lemon combo are what I’m concerned may not work well with this recipe. Just made these vegan and they turned out fantastic! Subbed 8TB coconut oil, and 1/2 cup applesauce + splash of lemon for eggs (so 1 cup total applesauce). I added 1/4 cup extra flour and 1/2 tsp extra baking powder. My add-ins were 1C fresh blueberries. I wish I could upload a picture, they’re beautiful! Yay, I’m so glad that worked well. So good to know! Yum, Carly! That’s a great idea to add the carrot puree. So glad you’re enjoying the muffins. When you say “If using whole grain Einkorn – decrease by 1/4 cup” are you talking about decreasing 1/4 cup of flour ? Hey Andrea, Yes, correct. Decrease the flour amount by 1/4 cup.